Brief Description: A brand-new, unused, unopened, undamaged Apple Iphone X in its original packaging. 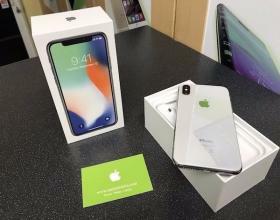 Detailed Description: A brand-new, unused, unopened, undamaged Apple Iphone X in its original packaging. Network: Unlocked Features: 4G Data Capable, 4G Data Capable, Bluetooth Enabled, GPS, Internet Browser, Wi-Fi Capable Storage Capacity: 256GB Lock Status: Network Unlocked In the Box - Apple iPhone X SIM FREE / UNLOCKED - USB Cable - Charger - Earphone Contact Us Now! Whatsapp: Mobile: +1(701) 428-1270 E-mail: urtechhouse@gmail.com.